We’d love your help. Let us know what’s wrong with this preview of Life from Elsewhere by Amit Chaudhuri. To ask other readers questions about Life from Elsewhere, please sign up. A thought provoking set of small essays on the role of literature, language, and identity. If anything can be said to connect each offering, it is the theme of individuality of experience. The sense that even if there is said to be a 'culture' of something or somewhere, it still includes, or should include, a wealth of variety and contrast. In modern society, with its cultural exchanges, technology, and fluidity of movement, art can still be used to both bridge the gap between people and celebrate our differences (Samar Yazbek). Emigration may still make people feel like a stranger in a strange place. But, as Andres Neuman suggests, that is not necessarily a bad thing; feeling like a 'foreigner' can enhance the sense of the strange, invite the role of the outsider, and make visible the frontier between worlds that forms the basis for so much great writing. As Alain Mabanckou puts it 'my concept of identity goes far beyond notions of territory or blood. I am nourished by each one of my encounters' [location 98]. Yet Elif Shafak argues that boundaries between places are becoming ever more important, ever more divisive, and she calls for a new narrative that is both inclusive and appreciative of difference (and with the UK referendum fast approaching, it's hard to deny the relevance of her words). Its interesting to note that she sees writers as being particularly sensitive to the issues, the role of difference and conflict in literature being an essential one. Overall, a topical and well crafted collection, brilliantly concluded with the biographical details of each writer so that the reader is quickly able to find out more about them and their works. Many thanks to Pushkin Press and Netgalley for this copy in exchange for an honest review. This collection of literature has been drawn from ten leading writers from all around the world. The themes of freedom and movement are quite prescient at the moment; and it is this that the authors have chosen to explore in their writing. These stories come to us from all around the world, from places of conflict like Syria and Palestine; an author tries to define where they live and another chooses to defy. We have stories of growing up and another author who feels links to his home country. Th This collection of literature has been drawn from ten leading writers from all around the world. The themes of freedom and movement are quite prescient at the moment; and it is this that the authors have chosen to explore in their writing. These stories come to us from all around the world, from places of conflict like Syria and Palestine; an author tries to define where they live and another chooses to defy. We have stories of growing up and another author who feels links to his home country. The best thing about this is its diversity. Each author has a distinct voice and perspective on their life and the world around them. As there are ten authors and each piece is translated by another person, you don’t get a seamless and even quality; but then that is an aspect of life too. Worth reading for a world view different from my own. An interesting book that has essays translated from original language to English. I was not really pulled into the collection but appreciate the intent. I have been reading a lot of world literature lately, both in translation and originally written in English, so Life from Elsewhere easily hooked me with its subtitle, "Journeys through World Literature." The collection contains entries translated from seven different languages (Arabic, French, "Israeli" (I think the publisher meant Hebrew), Persian, Polish, Russian, and Spanish), written by authors from such diverse countries as Iran, Poland, Congo, and Hong Kong. Accordingly, I expected the contributors to speak to their common themes - "movement, freedom and narrative" - with equally diverse voices. Instead, almost all of the authors focused on the concept of the "other" and its role in human culture, and, not surprisingly, they all agreed that exposure to different cultures through literature is an important tool in the struggle for mutual understanding over incomprehension and its frequent companion, fear. In the words of Samar Yazbek, "What art does is make us look into each other's eyes and into the eyes of those who are portrayed as our enemies, transforming them into human beings." While I echo and applaud this sentiment, most of the pieces in Life from Elsewhere were "singing to the choir": those who need to hear this message are not the people who will buy this book. Listening to her, he recalled how surprised he had been at the success of the book in this country. It hadn't been that successful anywhere else. The reviews at home were lukewarm. The ones abroad were even cooler. If his previous books hadn't done so well, it was doubtful that anyone would have bothered to translate it. And in this country - enormous success. Reviewers raved. Readers shook his hand, their eyes moist. And now he suddenly knew that it was because of her. Because of Lily Sigalovitch. His anger turned to bafflement - what had she done to his story? What secret ingredient had she added that made it all work? Gundar-Goshen eschews the blunt stick used by her fellow essayists in favor of the delicate nudge; she shows us how the literature of one culture may find its place in the hearts of readers halfway around the world. Life from Elsewhere was written to commemorate the tenth anniversary of English PEN's Writers in Translation program, and as a celebration of that program, it fulfills its purpose. However, if the true aim is "to celebrate books of outstanding literary quality, which ... promote ... intercultural understanding," a better approach would have been to actively promote the books themselves. Take the $8.95 you might spend on a paperback copy of Life from Elsewhere and use it to buy Gundar-Goshen's Waking Lions (available on February 28, 2017, for $13.99 in the Kindle version) or any of the other novels written by the contributors to this collection. Recommends it for: those interested in contemporary world literature. This was a hard work to rate, and so you may want to take the number of stars with a grain of salt. If you’re part of the niche audience of contemporary world literature devotees, you may love this book from beginning to end. For a more general reader—such as myself--there are golden nuggets scattered among a field of shiny gravel. I found the essays by Asmaa al-Ghul (i.e. “When Ideas Fall in Line”) and Andrey Kurkov (i.e. “Sea of Voices”) to be intriguing, even for the general reader. The former tells the story of a journalist who reaped a firestorm by posting a Facebook picture sans veil, but it offers insight into life under blockade in Gaza. The latter offers a Russian author’s experience of traveling in the Middle East, and the incidences of clash of cultures it offers was thought-provoking. 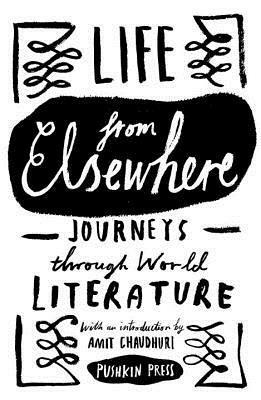 Life From Elsewhere: Journeys Through World Literature has been published through the Writers in Translation programme, which was established in 2005 with Bloomberg and supported by Arts Council England. It collects and champions the best literature from around the world. Key to the success of the programme is a substantial translation grant which makes it possible not only for new work from around the world to be enjoyed, but to also pay the often unsung heroes of this type of undertaking, the Life From Elsewhere: Journeys Through World Literature has been published through the Writers in Translation programme, which was established in 2005 with Bloomberg and supported by Arts Council England. It collects and champions the best literature from around the world. Key to the success of the programme is a substantial translation grant which makes it possible not only for new work from around the world to be enjoyed, but to also pay the often unsung heroes of this type of undertaking, the translators, properly for their work. Although the theme of this collection is about the role of literature in society, from a wide range of viewpoints and nationalities, it is approached relatively loosely. The result is a set of essays from some very perceptive writers who really do get to the heart of the power of literature. There is also a palpable sense of passion and conviction, as well as great eloquence in these essays which manage to convey some quite complex concepts to bring home their message. Certainly this is the type of book that can be dipped into repeatedly to study the writing style and enjoy the way words have been used to communicate ideas to a reader. The biographical details of the authors, many of whom I had not heard of, were very useful, and in combination with the writing will encourage me to delve deeper into any translations of their work. As always the translators of these essays should also not be forgotten as their invisible work has made for a smooth and enjoyable read. It is to be hoped that this will signal even more translations of great writing from authors who might not be heard of outside of their own country were it not for the use of skilled and perceptive translators. ‘Life from Elsewhere’ is a compilation of essays, some formal, some personal, written by a huge variety of authors from around the world. Published by Pushkin Press, the essays cover a number of concerns, such as migration, translation, and our increasingly globalised world. My main problem with the book is this: it really, really needs to be longer. There were so many topics covered – but only one essay for each! For me, there needed to be more structure, which would have allowed differing opini ‘Life from Elsewhere’ is a compilation of essays, some formal, some personal, written by a huge variety of authors from around the world. Published by Pushkin Press, the essays cover a number of concerns, such as migration, translation, and our increasingly globalised world. My main problem with the book is this: it really, really needs to be longer. There were so many topics covered – but only one essay for each! For me, there needed to be more structure, which would have allowed differing opinions to be more clearly stated. I think this would have greatly added to the reader’s experience, and really make them think. However, this definitely didn’t detract from the quality of the writing, which absolutely blew me away. This really solidified for me that I have to read more translated fiction, because I’m missing out on so much! The essays were universally eloquent, moving, and thought-provoking. Even when I didn’t agree with the author, I always respected their opinion, and found myself intrigued to learn more about their particular topic. One of the things I liked most about the book was that at the end, all of the authors and biographers had blurbs written about them, including their previous publications. As I hadn’t heard of any of these authors, I found this invaluable. The three authors who I will definitely be reading more of are Ayelet Gundar-Goshen, Hanna Krall, and Andrey Kurkov. My goodness, they’re good. And translated into English! I really, really need to start ordering some translations, and soon. An interesting collection of essays and short stories from an international group of writers and journalists about life in the modern era and what role art and literature will play. One unifying theme seemed to me to be the concept of 'identity' in an increasingly mobile society. In his article "The Dream Called Africa,"Alain Mabanckou writes, 'My concept of identity goes far beyond notions of territory or blood.' He is an African with ties to three continents. Another article talks about growin An interesting collection of essays and short stories from an international group of writers and journalists about life in the modern era and what role art and literature will play. One unifying theme seemed to me to be the concept of 'identity' in an increasingly mobile society. In his article "The Dream Called Africa,"Alain Mabanckou writes, 'My concept of identity goes far beyond notions of territory or blood.' He is an African with ties to three continents. Another article talks about growing up as an Argentinian living in Spain--with only a doorknob separating the two worlds of his life. Another article discusses the role of art and literature in the modern era: can reading novels about other cultures and lives foster understanding? Although there's a certain unevenness in the quality of the writing, this book is definitely worth reading to expand one's global understanding, something much needed in this world. A short decade of essays and fiction pieces about what it means to be other or an outsider or identity or -- I'm not really sure what the prompt was for these essays precisely. I think it's identity, maybe. That seems like a big enough umbrella to fit all these essays underneath. And they aren't all essays either. Both Ayelet Gundar-Goshen's and Hanna Krall's submissions are fiction (or at least, intentionally read like fiction), and of course, with my love of narrative and difficulty following n A short decade of essays and fiction pieces about what it means to be other or an outsider or identity or -- I'm not really sure what the prompt was for these essays precisely. I think it's identity, maybe. That seems like a big enough umbrella to fit all these essays underneath. And they aren't all essays either. Both Ayelet Gundar-Goshen's and Hanna Krall's submissions are fiction (or at least, intentionally read like fiction), and of course, with my love of narrative and difficulty following non-narrative arguments, those are the two that'll probably stick with me (and not just because Gundar-Goshen's story is very similar to a story idea I had a few years ago so it's time to put on my tin-foil hat so she doesn't steal any more of my ideas). But the white space in the snippets by Hanna Krall -- I have put the only Hanna Krall book in the library on hold so I can read more from her. I suppose that's the point of collections like these, hit or miss, it's unlikely that all is a miss. So you find someone new you wouldn't have found otherwise. The rest just sort of fades. Life From Elsewhere by various authors went on sale June 21, 2016. I really like the idea of this book: a collection of stories written by prominent writers about their home country. I find it fascinating to read about a culture through an insider's eyes. And most of the stories included in this collection were fascinating. The problem I found with this book was that the stories were too disjointed to form a cohesive collection. Some writers talked about literature, one discussed women's rights, others wrote about translating their work into english, a few talke I really like the idea of this book: a collection of stories written by prominent writers about their home country. I find it fascinating to read about a culture through an insider's eyes. And most of the stories included in this collection were fascinating. The problem I found with this book was that the stories were too disjointed to form a cohesive collection. Some writers talked about literature, one discussed women's rights, others wrote about translating their work into english, a few talked about everday life in their country. While most of the essays were really great to read on their own, a central point to the book was missing. I think if someone were to publish this book again with a narrower focus for the essayists it would be a hit. Life from Elsewhere is a collection of essays all translated to English, that focus on issues of literature, multiculturalism and freedom throughout the world. The essays were moving, with some more thought provoking for me than others, but all superb. The final essay, Elif Shafek, was my favorite. The author wrote, " We must find an embracing, pluralistic narrative that can speak to the minds and hearts of people from different cultural, ethnic and religious backgrounds. A narrative that is not Life from Elsewhere is a collection of essays all translated to English, that focus on issues of literature, multiculturalism and freedom throughout the world. The essays were moving, with some more thought provoking for me than others, but all superb. The final essay, Elif Shafek, was my favorite. The author wrote, " We must find an embracing, pluralistic narrative that can speak to the minds and hearts of people from different cultural, ethnic and religious backgrounds. A narrative that is not afraid to speak louder than exclusivist voices, whether in Europe or the Middle East or elsewhere. What we need is a compassionate but equally radical and courageous type of humanism." Life and literature, and journeys and different places trough the words of famous writers and their translators. Some stories are better than others but all of them are beautifully written. La vita, la letteratura e i viaggi e i differenti posti attraverso le parole di autori famosi e dei loro traduttori (inglesi). Alcune storie sono meglio di altre, ma tutte sono molto ben scritte. THANKS TO PUSHKIN PRESS FOR THE PREVIEW! This is an essay collection from writers, professors, journalists, etc. from various parts of the world. While the collection as a whole lacked a unifying theme, I really enjoyed each one individually. Lately, I've actively been striving to read perspectives that are different from my own, so I fully support the idea of a collection like this. Thanks to Netgalley and Pushkin Press for the e-galley. Reflections on nationality, globalisation, writing and translation to celebrate 10 years of the English PEN tarnslation programme. Inevitably with various authors, some will hit the spot more than others, but being so short the good are small and perfectly formed, and the less good do not overstay. Amit Chaudhuri was born in Calcutta in 1962, and grew up in Bombay. He read English at University College, London, where he took his BA with First Class Honours, and completed his doctorate on critical theory and the poetry of D.H. Lawrence at Balliol College, Oxford, where he was a Dervorguilla Scholar. He was Creative Arts Fellow at Wolfson College, Oxford, from 1992-95, and Leverhulme Special R Amit Chaudhuri was born in Calcutta in 1962, and grew up in Bombay. He read English at University College, London, where he took his BA with First Class Honours, and completed his doctorate on critical theory and the poetry of D.H. Lawrence at Balliol College, Oxford, where he was a Dervorguilla Scholar. He was Creative Arts Fellow at Wolfson College, Oxford, from 1992-95, and Leverhulme Special Research Fellow at the Faculty of English, Cambridge University, until April 1999, where he taught the Commonwealth and International Literatures paper of the English Tripos. He was on the faculty of the School of the Arts, Columbia University, for the Fall semester, 2002. He was appointed Samuel Fischer Guest Professor of Literature at Free University, Berlin, for the winter term 2005.